Not to be confused with the mainstream and widely distributed Bon Ami Powder Cleanser, Bon Ami still makes its 1886 formula, originally sold in a bar, but now in powder form. When Bon Ami Original 1886 Formula was created it was state-of-the art, crafted to care for homes and kitchens with a gentle effectiveness that was unlike anything else on the market. The recipe was simple: tallow soap and feldspar. Bon Ami’s innovation was adding the more gentle abrasive powder feldspar to make a soap that was effective at cleaning but gentle on surfaces. We still make the 1886 Formula Cleaning Powder the same way. We find that many customers prefer this formula for specialty uses. The easy-to-shake can contains gentle feldspar abrasive for polishing and soap for cleaning all hard surfaces. Use to defog windows and mirrors. 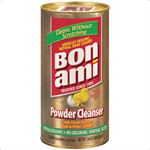 This is the only Bon Ami powder that is recommended for use on glass. Because car makers now use some non-glass materials, Bon Ami no longer recommends the use of Cleaning Powder on auto glass. NASA even used Cleaning Powder to clean the windows on Skylab. Many allergists recommend original Bon Ami because the natural ingredients contain no detergent, bleach, perfume, or dye. 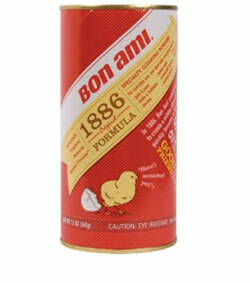 Ingredients in Bon Ami 1886 Formula: Baking Soda (Sodium Bicarbonate), Tallow Soap. Fels Naptha Laundry Bar 5.5 oz. Fels-Naptha is recommended by the Queen of Clean for pre-treating greasy, oily stains like perspiration stains and ring-around-the-collar.